The Knights of St. John are one of the oldest institutions of Western and Christian civilization. The order began around the first crusade to take care of pilgrims in the Holy Land. They are a lay religious Order of chivalry, with military roots and a commitment to helping the sick and the poor. This is a decorative sword inspired by the Order of St. John of Jerusalem. 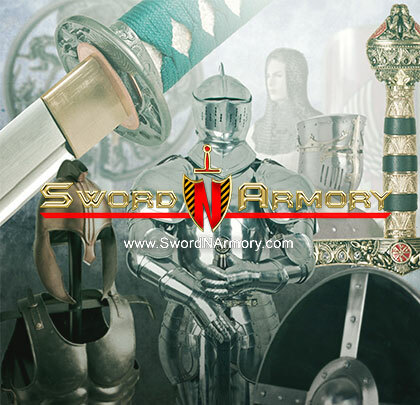 Blade: The blade of the sword is 440 stainless steel with slightly sharpened edges and a very sharp point. A fuller runs down the center of the blade to a long Ricasso. A Maltese Cross in relief rests in the center of the Ricasso with the words "Knights St. John." Scabbard: The scabbard of the sword has been constructed from polished stainless steel with ornate silver fittings. Three silver carrying rings have been added to the scabbard. A Red Maltese Cross decorates the fitting securing the carrying rings. The scabbard throat is silver steel. Guard: The guard of the sword is a cut out Quillon design with a silver eagle in the center. On the opposite side of the eagle is another Maltese Cross. Handle: The handle is white with a silver Knights Helm and a chain guard.